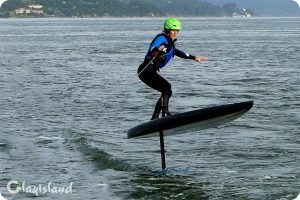 Practice – another step forward in learning to fly a SUP Go Foil by being towed behind a boat, the Barbary Ghost. It’s been a while since I have been pulled behind a boat, I forgot how much fun the group camaraderie is. One of the reasons I am documenting my learn to foil experience is to give a realistic account of progressing. The pros make it look so easy, as do the experienced kite foilers. Seeing some of the video of myself I feel a bit embarrassed, it is humbling to be a beginner again and struggle to grasp the basics. At the same time I remember how hard it was to learn to downwind SUP surf, SUP surfing before that, and prone surfing way before that. I suspect it will be fun to have video of how much we struggle now and then in the future to have video of us foil surfing with ease. I am enjoying the journey and getting a lesson in patience as I take these baby steps forward in learning fly this gofoil. Thanks to all for coming aboard the boat, and thanks to Captain Drew and the Barbary Ghost. I hope to get out there with you all again soon.